This one is for the traditional guys. 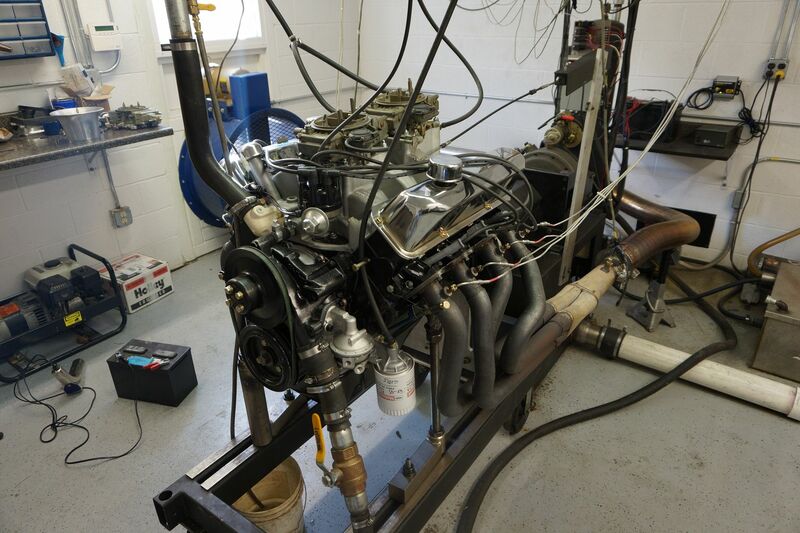 Engine started out as a long term collection of parts that the customer had accumulated. Block is a factory 427 service item. Heads are a nice set of factory 427 High Riser castings. Crank is a CAST 390/427 item at standard stroke. Intake is the "better" factory high riser 2x4 "F" piece. Lots of original 50 year old Ford stuff running here! We did do a very careful valve job on the heads - the original factory radius job was just too compromised to use. But we kept as much of that profile as possible "first do no harm". Compression was dropped to the middle 10s for pump gas using a custom set of Diamond pistons. Rods were replaced with a new set of H beams - bravery only goes so far here. 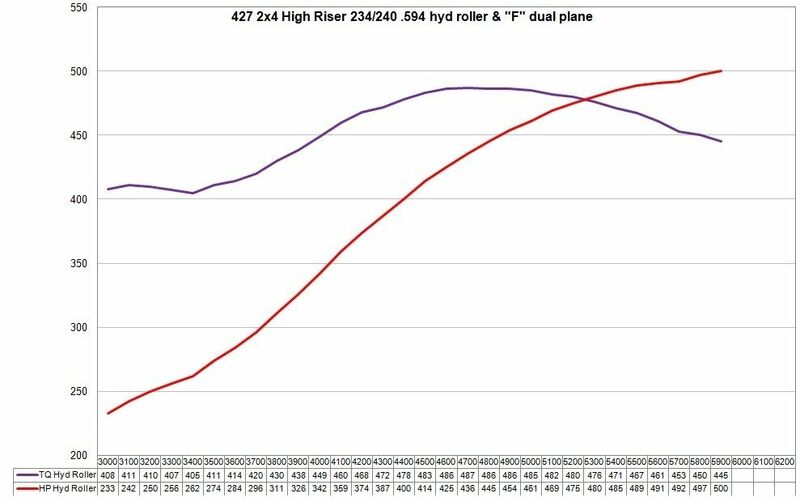 A nod to the intended street use and reducing maintenance was a hydraulic roller - what has become my favorite "go to" for engines in the 430-450 cube range is 234/240@ .050 with .594/.598 lift. We also used customer supplied Dove rockers with our own hand made billet end stands. 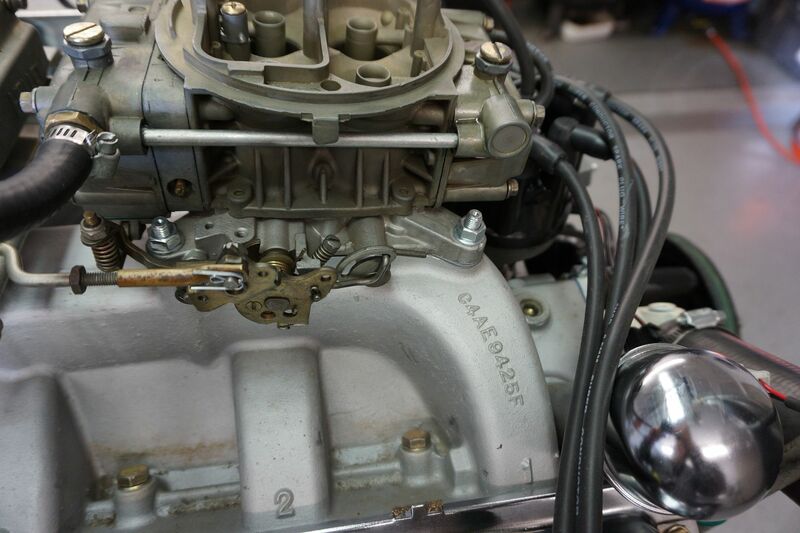 Carbs are a pair of mystery items provided by the customer - appear to be a couple generic 600s with modifications and we freshened them with plans to change if required. They looked rough but ran fine. Engine fired up with no drama (OK - the dipstick tube leaked) and we broke things in, checked timing and went to work. Tried a bunch of little things on it and had some nice results with 38 total and minimal carb tuning. After a few pulls in the 490+HP range at around 6000 I decided to go for one more round with a couple velocity stacks I keep in the dyno for grins - we were "that close" to a 500! Besides - velocity stacks look about right on a vintage engine, although the high tech duct tape mounting technique is a bit suspect. The stacks did their thing and we finished up with a 500HP peak right at 5900 RPM - just a little "uptick" at the top of the pull. No higher RPM pulls at the request of the customer at that point - earlier "stack free" pulls had peaked by then, so we were not likely to see big gains anyhow. Peak torque was 487 pounds at 4700 - I consider that to be a darn nice number with those big volume ports and low compression.